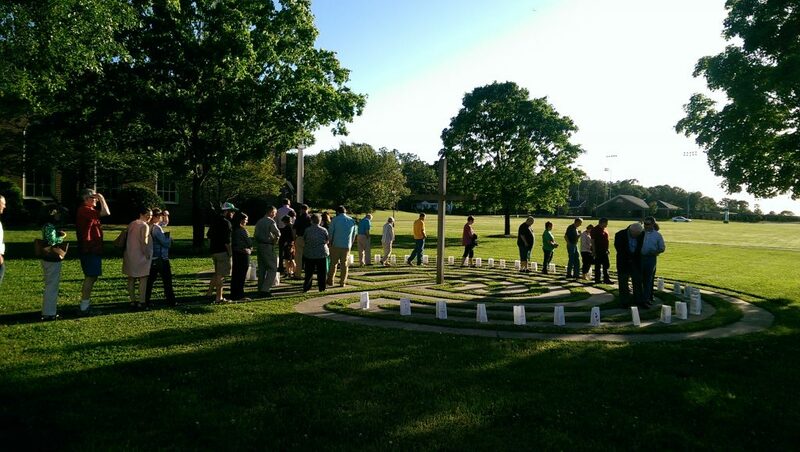 The prayer labyrinth was the Eagle Scout project of James Sargent, assisted by the Scout master, Darryl Bridges and other leaders and members of Scout Troop 117. The project was completed during the month of May, 2009. The labyrinth is an archetype, a divine imprint, found in all religious traditions in several forms throughout the world. The labyrinth you will walk today is a portable one fashioned from canvas and modeled after the labyrinth inlaid in the floor of Chartres Cathedral in France around 1220 CE. Many people are rediscovering the long forgotten mystical tradition of following this spiritual path. This labyrinth has only one path, so there are no tricks and no dead ends. The path winds throughout and becomes a mirror for where we are in our lives. Since the destination is assured, there are no obstacles to overcome, no mistakes to worry about, no dead ends to retrace, no pathways to figure out. What remains for the labyrinth walker is simply the deeply meditative and symbolic discipline of setting one foot in front of the other, of honoring the journey itself and what it can teach. The mind can be stilled allowing attention to be paid to the body, the wisdom of the heart, and the grace of being rather than doing. Whoever you are, walking the labyrinth has something to offer you. Such a journey into and out of the labyrinth touches our sorrows and brings out our joys. If a creative or work project is facing you, walking can get your creative juices flowing. When you are struggling with grief or anger or a physical challenge or illness, walking the labyrinth can point the way to healing and wholeness. If you desire a way to pray or meditate that engages your body as well as your soul, the labyrinth can be such a way. When you just want reflective time away from a busy life, the labyrinth can offer you time out. The labyrinth, as you can discover, holds up a mirror, reflecting back to us not only the light of our finest selves but also whatever restrains us from shining forth. Walk it with an open mind and an open heart. Take whatever pace you would like. Don’t be concerned about others, who are walking at the same time. You may “pass” people, or let others go around you. The path is two ways. Those going in will meet those coming out. Do what feels natural for you. If you try to force some experience, while walking the labyrinth, then often you will have no significant experience. Even those times can be learning experiences. Preparation: Take a few moments before you begin to center yourself . . . to pray . . . to reflect on your needs at this point in your life. Clear you mind. Purgation: As you walk toward the center, go through a time of releasing . . . letting go of the details of your life. This is an act of shedding thoughts and emotions. It quiets and empties the mind, so that we can open ourselves to God. Illumination: When you reach the center. Stay there as long as you like. It is a place for prayer and meditation. Receive what God has for you to receive in love, in affirmation, in healing, in guidance. Union: As you leave the center join yourself with God and what God has revealed to you. Affirm the healing power you find . . . the call you sense . . . the alternative you are led to live. Seek that for which your soul yearns at this time in your life. Reflection: As you complete the labyrinth walk, continue to reflect upon your experience, and discover the areas where you have grown.